The Bombay Store’s LAUNCHPAD initiative to help young designers and start-ups, has successfully showcased over 20 brands in the past one year. And we are now pleased to announce our latest edition of LAUNCHPAD; a non-profit lifestyle brand – AIYANA. AIYANA, an integral part of the Umeed Foundation, has an on going showcase of its summer collection of custom designed PHULKARI lifestyle and home décor products at The Bombay Store from 17th April. All products are handmade by phulkari artisan women in Punjab & all the sales proceeds are contributed to the upliftment of these artisans. Aiyana was started in 2010 as a fashion brand that would revive heritage crafts in Punjab through contemporary designs and product formats. An initiative by the UMEED Foundation, Aiyana today supports over a 100 women artisans across 5 production centres in Sangrur. The design team at Aiyana works with artisans as they revisit their forgotten skills of fine crochet and Phulkari. Aiyana’s designs reflect a modern fashion sensibility built on traditional handicrafts – giving them a fresh lease of life. With a foundation in rich heritage crafts, Aiyana’s collections are delicate, intricate and tempting where every product has its own unique story. Witness an authentic range of table mats, runners, cushion covers, coasters, evening wear clutches crochet potlis, wine bags and more. The collection will be available for sale at The Bombay Store, Fort, Mumbai till 4th May. 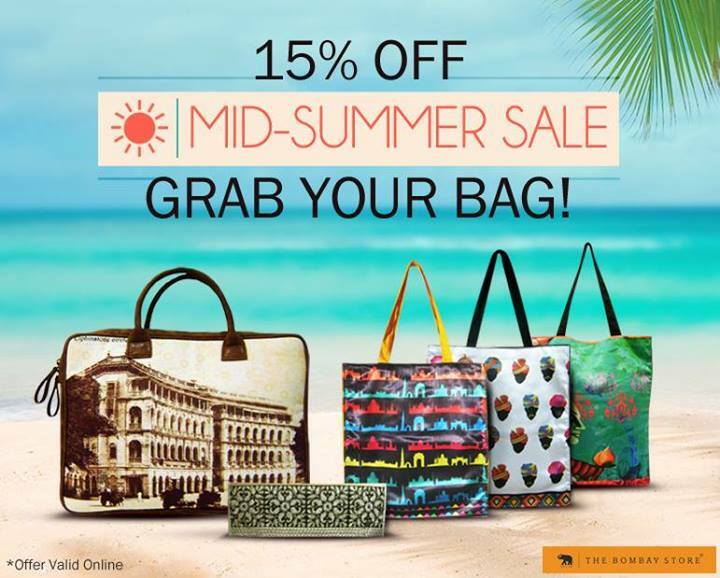 ‘Grab your Bag’ at 15% off! It’s summer time! Summer is synonymous with vacations, beaches, sunglasses and bright colours. And to help you find the right bag for each of these occasions, we present to you some of the best styles of vibrant summer bags online. Not only this, the good news is that you can bag them at a Flat 15% off at www.thebombaystore.com from 19th April to 28th April. Trendy slings, clutches, handbags, Jhola bags, tote bags; name it and we have them all for you. Apart from this dazzling collection of bags for the ladies, we also have a designer range of Ipad slings, Ipad sleeves, Laptop sleeves and Laptop Bags at a 15% off. Give your Gizmo a royal feel with dashing sleeves and bags. Don’t give this a second thought. Go ahead and pick your arm candy for the season now. As many of you may know, The Bombay Store has recently launched its second store in the Garden city of India – Bangalore. 1. Photographs shared should be original and clicked by the participant. 2. 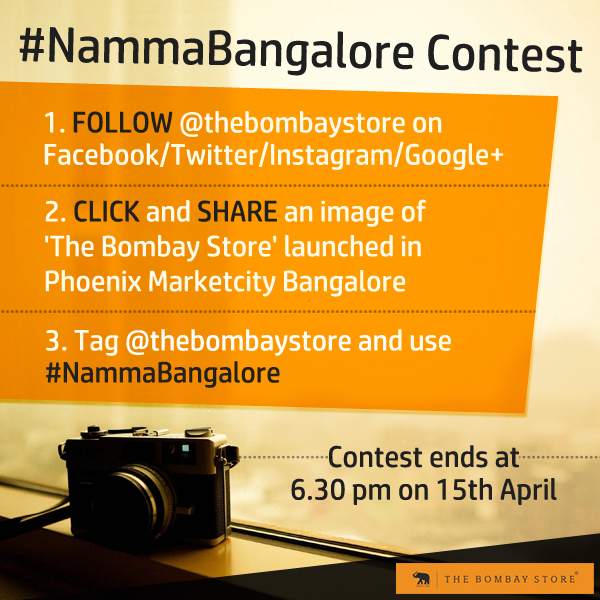 Two participants with an interesting and good photograph that best depicts The Bombay Store Bangalore will win. 3. Contest ends at 6.30 pm on 15th April 2014, and winners will be declared on 21st April 2014. That’s all you have to do win an exciting surprise gift from The Bombay Store. So, what are you waiting for? Pick up your cameras and get going now! second store in this city. with classy décor and elegant interiors. It implements a balance distribution of space that is luxuriously merchandized with wide assortment of lifestyle products broadly categorized into Artefacts, Home Décor, Fashion Accessories and Wellness. Our emotions with this new store launch can’t be described in words. Maybe the best way you could witness them is by visiting us. So do drop in at the store anytime between 10.30 am to 7.30 pm. We know you are going to love it! With the arrival of summer, we bet you got yourself an all-new summer wardrobe. So now, it’s time to give your home a Makeover! We believe that your living space should reflect your personal taste. So spruce up your living room with these easy decorating tips. Hang a mix of frames and paintings on the wall. It will perk up the room and make a great style statement! B) Welcome pops of Colour! Embrace a colourful cushion print and add some contrast to a low-key sofa. Mix in a colourful accent with these smart hits of colour. Choose a living-room lamp that’s lovely to look at, whether it’s on or off. And to let you pick up your favourites from our eclectic collection of lamps, we are running a flat 50% off. Don’t give this a second thought. Get inspired and Do it yourself!